Alligator Flag is an emergent aquatic plant. The name Alligator Flag is derived from its use in spotting alligators. The unexpected movement of the leaves is sometimes a sign that an alligator is swimming below. The root system is well-developed and extensively intertwined. Large leaves are broadly lanceshaped, having a rounded base and a pointed tip (> 1 m long). The leaf blade is held by a long, smooth, green or red-purple leaf-stalk. It has a thick rhizome. 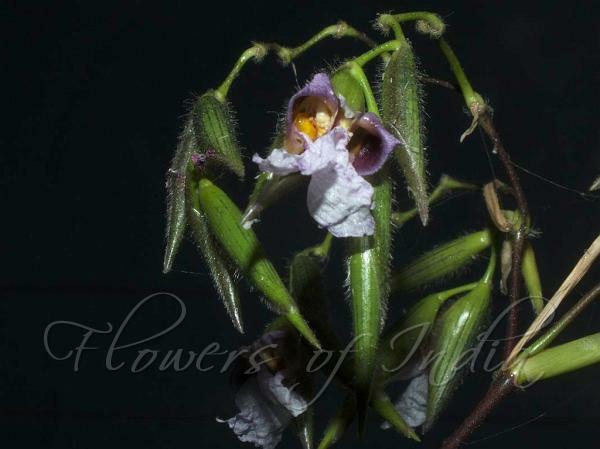 Paired flowers are suspended from a zigzag-shaped inflorescence stalk. Small, purple flowers, 2 cm long, are composed of 3 petals and have an irregular shape. A white, petal-like bract hangs below the flowers. Fruits are known as utricles, containing a single brown to black seed. Alligator Flag is native to C. America and Africa. Identification credit: M. Sabu Photographed in Nischal Nursery, Panipat, Haryana.